These seasonal craft beers are sure to put you in the winter spirit. Perhaps inspired by the majestic, snow-capped Rocky Mountains, Colorado brewers excel at winter beers, from ales to stouts. Visit a few Denver breweries this winter to warm up with friends and sample some great seasonal beers. 1. Hibernation Ale — Great Divide Brewing Co. Hibernation Ale has been a celebrated winter tradition since 1995. This robust, dry-hopped English-style old ale has a malty richness balanced with a complex hop profile and hearty, warming character. Stop into Great Divide’s downtown tasting room or RiNo Barrel Bar and get cozy with this brew. Breckenridge Brewery’s Christmas Ale boasts a winning winter combo of flavor and strength. At more than seven percent alcohol with a sturdy texture and rich flavors of caramel and chocolate, this holiday seasonal is the fermented equivalent of a roaring fire. 3. Artillery Ale — Wynkoop Brewing Co.
Colorado&apos;s first brewpub celebrates its 30th anniversary this year — and they still brew a mean beer! Wynkoop&apos;s Artillery Ale is a big, boozy imperial brown ale aged on oak and includes notes of bourbon and vanilla. 4. Graham Cracker Porter — Denver Beer Co. The brewmaistes at Denver Beer Co. describe this brew as a “campfire in a glass.” The seductive notes of vanilla, smoked cedar and mulling spices make it perfect for a chilly winter evening. With the taste of lush chocolate and a semi-dry finish of roasted malt and biscuit, you’ll soon discover why the Graham Cracker Porter is one of Denver’s favorites. Like a perfect bluebird snow day in a glass, this refreshing Colorado Rockies lager with a German pilsner malt backbone from Epic Brewing is a winter must-drink. The subtle malt flavor is balanced with spicy, herbal noble hops and finishes crisp and clean. A powerful imperial stout from Oskar Blues, the brewers call this the "ultimate celebration of dark malts and boundary-stretching beer." And we can&apos;t say we disagree. Need a little boost to get through the dark days of winter? This creamy nitro cold brew pairs the alluring aroma of Allegro Coffee with Left Hand&apos;s chocolate malt porter, bringing out mocha, coffee and toffee notes and putting an extra pep in your step. This sweet caramel ale from Odell Brewing is balanced by a crisp hop finish, making it an excellent choice for those chilly winter nights. Who says winter beers have to be dark and heavy? New Belgium&apos;s Accumulation White IPA — stacked with mosaic and Amarillo hops — is as cold and refreshing as that first snowfall of the season. This winter strong ale from Avery Brewing has a distinctive mahogany hue with hints of hazelnuts and a finish reminiscent of mocha and toffee. It&apos;s the perfect blend of five specialty malts and a great sip during the holiday season. Don&apos;t miss this spiced, Belgian-style dubbel from Boulder&apos;s Upslope! Its ruby red color will give your Christmas tree ornaments a run for their money, and its rich malt flavor will send you back to the bar asking for more. A tribute to everyone’s favorite holiday fashion statement, this eccentric take on an English brown ale includes roasted pumpkin seeds and palm sugar. This New Year&apos;s Eve tradition has quickly taken on a life of its own! Each keg of Depravity has one pound of peanut butter cups and one pound of dehydrated peanut butter, giving this imperial stout a rich and velvety mouthfeel. It&apos;s the most decadent way to end the year before your resolutions kick in. 14. Snowed In Imperial Oatmeal Stout — Copper Kettle Brewing Co.
At 12.4 percent ABV, this imperial oatmeal stout is the perfect warm-up for a snow day. This year&apos;s release was aged in Breckenridge Bourbon barrels with chocolate and coffee roasted by Sonder. There’s no need to wait for the holidays to get your gingerbread on! 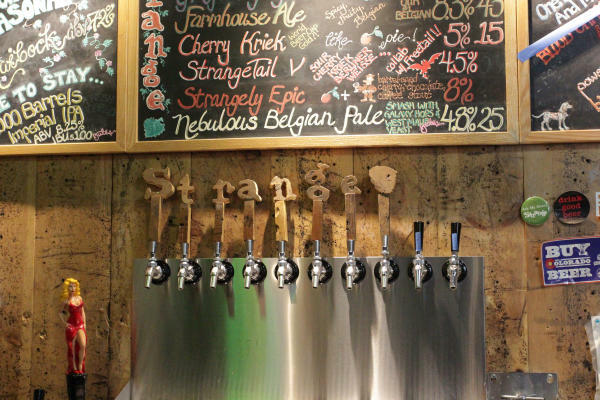 Strange Craft taps this sweet winter seasonal American brown ale in November. Joyride Brewing has a porter for everyone this holiday season — no matter which of Santa&apos;s lists you end up on! The Naughty Porter includes cherries and chocolate, while the Nice Porter has hints of vanilla. 18. Powder Session — Comrade Brewing Co. This session IPA from Comrade Brewing is the perfect companion for a powder day spent on the slopes. Citra, Mosaic and Simcoe hops make for a refreshing first sip and a crisp citrus finish. A collaboration between Crazy Mountain and Coda Coffee, this coffee stout is "an ode to the colorful characters who flatten snow in the wee hours of the night, ascending into darkness without fear and living in a world of powder."